Welcome to the New Blog and the first in a series of foundation establishing blogs. As a teacher at heart, I am really inspired to share the principles I have used to establish wholeness in my life. I believe wholeness to be the ultimate state of being and state of consciousness. Wholeness reflects authentic love, peace, and pride. Today, I would like to look at the three intrapersonal loves; intrapersonal meaning within an individual. Those three inward loves are Self-Love, Source-Love, and Loving Emotions. I believe that in order to really establish wholeness that we must look at these loves and understand their roles. We've Officially Moved Into Our New Home!! Hello There! Well, I surely hope you are having a beauty filled day thus far. I just wanted to let you know that we are now at road2wholeness.com and our first blog is already up. The title is "The Three Intrapersonal Loves". Hope you'll visit us at our new home today!! Be Absolutely Blessed!! Good Morning Subscribers. 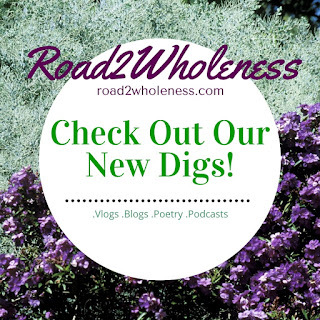 Thank you for continuing to love and support the Road2Wholeness Blog. As a result of wanting to provide more content and resources for our readers, I've decided to move the blog from blogger. The blog will re-launch on Wednesday March 23, 2016 at its new location; TBA. 1. ROAD2WHOLENESS: THE FUNDAMENTAL OUTLOOK, which begins with my take on the "The Three Intrapersonal Loves"... Self-Love, Source-Love, and Loving Emotions. 2. NEW BIMONTHLY FEATURED BLOG called "In Hindsight". This blog is a Single Teenage Mother Retrospective written by my mother (a former single teenage mother of two) and aims to support and empower teenage mothers along their journey. 3. THROWBACK BLOG THURSDAYS! This is where I pick a blog from our archive and give up an updated view through a short video message or snap chat.